The sports themed corrugated base handles non-Helium inflatables well enough, but Helium-filled requires this NFL Steelers Football Balloon Binder Clip solution. The Clip itself could grip direct to the corrugated, but instead it anchors to Corrugated Hooks allowing outboard positioning on the display. The Clips are also useful to the ultimate purchases in their display and to keep the bouyant balloons from just drifting off ceiling-ward. 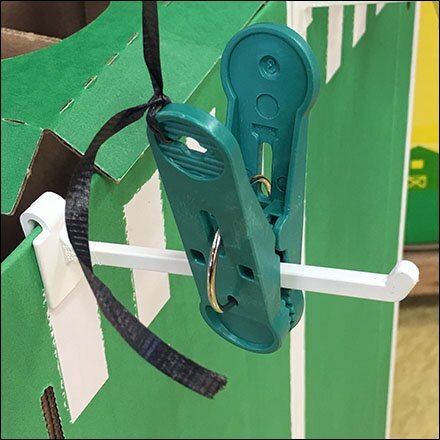 This NFL Steelers Football Balloon Binder Clip and Corrugated Base seen at Weis.